Only 10 left in stock (more on the way). Ships from and sold by Amazon.ca. Gift-wrap available. CDN$ 24.08 Unlock 10% savings by subscribing to 5 products. A multi 12 in 1 miracle leave-in treatment. Acts as a superior cutting lotion. Repairs dry, damaged hair. Adds manageability and silky condition. 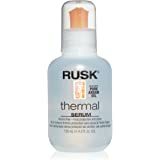 RUSK Designer Collection Thermal Serum with Argan Oil, 4 fl. Oz. An all-in-one lightweight leave-in treatment for all hair types. It immediately helps to control frizz, smooth, detangle, moisturize, strengthen and add body to dry, damaged hair. Can be used with heat and acts a thermal protectant to provide shine, control and conditioning from the inside out. Final product not tested on animals. RUSK is one of the premier salon brands in the world – a brand that taps into contemporary life, to what people are feeling, how they want to look & what they want to use on their hair. Je suggère dans mettre sur les mains et ensuite appliquer sur les pointes . Exactly what I was looking for! This is my favourite leave-in conditioning product. Very oily!! I can't see any difference. I should have stick with Designer Collection™ Thick™ Body and Texture Amplifier. 5.0 out of 5 starsNatural thick "not mixed" hair wonder!! I LOVE THIS PRODUCT!! I always get compliments on how silky, soft and shiny my hair is (beware! After using this some random will attempt to run their fingers through your hair). I've tried all of the leave on conditioners and this has by far been the best. I originally bought this on a whim at Marshall's and since I can't find it in stores, I'll be a faithful buyer here. I've read other reviews saying it made their hair "limp". You can only use about 6 sprays at a time BEFORE STYLING(depending on the texture of your hair). The only negative is the product "builds up" really fast, so I end up washing my hair more than usual. Worth it!!! Very good for curly hair, I use it before my regular curling cream and my curls end up looking great - I can tell the difference when I skip it and get very good comments when I do. I can't live without this product. It makes my hair smoothers the cuticle, eliminates frizz, and improves elasticity, leaving my hair soft, silky and manageable. I've bought this product a couple of times and I'll continue. 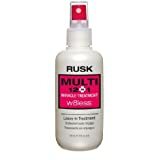 I spray my head down with Rusk after each shower and my hair seems to be doing a lot better each day, healthy wise. Not only that, it has heat protection in the spray so you can straighten your hair or blow dry.